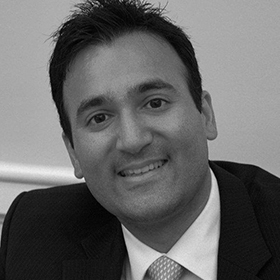 Maninder Saluja joined Quilvest in 2005 and is a Partner based in and responsible for the oversight of Quilvest’s Hong Kong office, from where he co-manages QS GEO PEP, Quilvest’s Global Emerging Opportunities Private Equity Program. In addition, he sources and executes direct and co-investment opportunities primarily in Asia and Latin America as well as selectively in Central & Eastern Europe and Africa. Prior to joining Quilvest, Mr. Saluja worked at Alvarez & Marsal, a prominent crisis management and restructuring advisory firm, where he worked with creditors and distressed companies in various operational and financial turnaround situations across the United States and Latin America. Prior to A&M, Mr. Saluja worked as the Director of Finance and Strategic Planning for a communications provider in the Northeastern United States. His responsibilities included capital raising, M&A, partnerships, plan development, and product pricing. Mr. Saluja started his career in the Media & Communications and International investment banking practices of Donaldson, Lufkin & Jenrette, both in New York and Hong Kong, where he worked on a variety of high yield, M&A, restructuring, public and private equity transactions. During his time at DLJ, Mr. Saluja worked on transactions across the US, Western and Eastern Europe, Latin America and Asia. Mr. Saluja received his MBA from the Harvard Business School and a BBA with a concentration in finance from the University of Michigan. Mr. Saluja is a board member or observer on a number of Quilvest’s fund and direct investments.